An online poker bill was signed by Nevada Gov. Brian Sandoval that allows for partnership agreements with other states without receiving federal approval. The bill was deemed an emergency and was rushed through the Nevada Legislature. A hearing held by the Assembly and Senate Judiciary committees lasted just 90 minutes before both houses voted unanimously for approval of Assembly Bill 114. The bill was quickly forwarded to Gov. Sandoval, who wasted no time in affixing his signature. Sandoval labeled the bill a priority during his State of the State address in mid-January and the urgency was heightened when it was learned that New Jersey lawmakers would likely approve of the proposals set forth in Gov. Chris Christie’s conditional veto of the Garden State’s online gambling bill on Feb. 7. Christie admitted he would sign the bill post-haste when it arrives on his desk on Feb. 26. 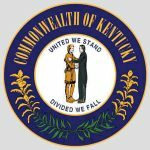 Both states are vying to become a hub of online poker and gambling, setting the tone for other states to make use of their existing gambling regulations when entering the market. Nevada has had an early lead in their quest to be the first state to offer online poker and hope to maintain that lead by fast-tracking the interstate compact legislation. 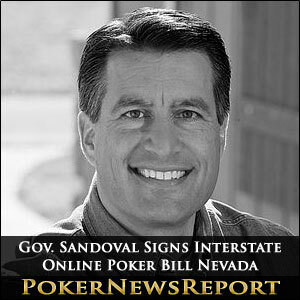 Sandoval called his signing of the bill a historic day in which Nevada will enter the next frontier of gaming, the Las Vegas Sun reported. 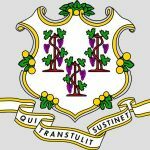 Just last week, the bill appeared to be in jeopardy when Majority Leader William Horne proposed an increase in online poker license fees from $500,000 to $1 million. Sandoval did not support an across-the-board increase, and a compromise was reached that will allow the Nevada Gaming Commission to charge more for licenses in certain situations. 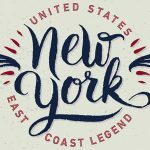 It appears that license fees will be determined on a case-by-case basis and will cost at least $150,000, but not more than $1 million. The license renewal fee will remain at $250,000. The new legislation also includes a provision that restricts companies that serviced the U.S. online poker market after the UIGEA was enacted in 2006 from participating in Nevada’s Internet poker scheme for a five-year period. That will keep industry leader PokerStars out of Nevada until 2018. New Jersey’s law has no such bad actor clause and PokerStars has made a bid to purchase an Atlantic City casino in order to enter the online marketplace in America. There is no telling yet how that may affect a possible interstate compact between the two states.